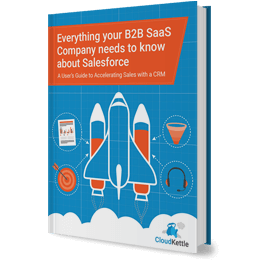 If you’re a fast-growing B2B SaaS company, your CRM is the foundation for managing complex sales cycles, reducing churn, and empowering your Sales team to close deals faster. This eBook will help you to take your CRM from being just a database of client information to a platform that accelerates your Sales team’s impact, streamlines Marketing’s efforts, and enables Customer Success. This eBook also covers how to: keep your investors happy using real-time reporting and leverage your CRM to make data-driven decision to grow your business. All with easy to follow steps, in plain English, plus helpful templates and a free Salesforce Top Tools list to get you started.